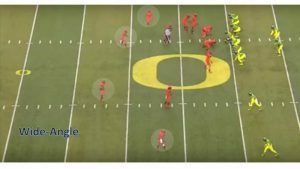 How Important Is FILM STUDY to Oregon Football? There are things coaches place the most importance on each year for a program to be successful, but watching film is a must when it comes to growth. There is no other sport that relies on film study like the game of football. There is no preparation more important than understanding how to study film or as coaches call it breaking down film. I can remember preparing for the Kentucky High School 2006 AA State Championship game, where film study played a large role. I began the week having all of the 12 previous games of our opponent determine how we were going to attack. Our opponent typically played a defensive front that had four defensive linemen and four linebackers (considered a 4-4 scheme). The team was extremely athletic, in great condition and most importantly well coached. Sunday — The football staff spent the entire day breaking down each film based on offense, defense and special teams. This also helped me make a quality scouting report on our opponent. I was able to identify numbers and position of players of interest that we felt, as a staff, was important. Monday – We spent most of this film session with players. We reviewed the scouting report and had the players take mental notes on the game film cut-ups created by our staff on Sunday. We then completed a player walkthrough on the practice field of the film we had just analyzed. Each day after practice, coaches would pull their positions and review the game film in a smaller group setting. Urban Meyer and Chip Kelly doing film study. Tuesday — A full day of practice for our offensive team and we completed practice with a small defensive walkthrough (again all from film study). Wednesday — A full day of practice for our defensive team and we completed practice with a small review of offense (again all from film study). Thursday – We split the day with offense, defense and had a primary focus on special teams. We had sprinkled in special teams all through the week as well. Friday — Game day. Player spend time on their own to review film study cut-ups, cramming as if for a social studies class final to ensure they were completely prepared. Coaches can thank technology for allowing players and coaches to have instant access to study film of their opponents. It becomes a cat-and-mouse game where coaches break down film of a whole season of an opponent just to prepare for a single game. That sounds cumbersome, but the success of the Ducks in the past and the present has relied on a coaches ability to expose the weaknesses of their opponent’s players to be prepared for anything. A phrase that I used on a regular basis as a coach when watching the film with players is “How can they hurt you?” This is merely having players think for themselves during a game situation and how the opponent will maybe align on offense or defense on the attack. Also, this creates a mindset of thinking and playing fast. 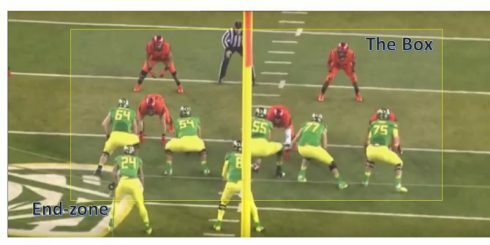 The image to the right is a great example of the technology that Oregon coaches have access to, and their ability to be prepared for just about anything if the right amount of time is put into watching film. In this room, the time spent can help make or break a scouting report. Preparation is the key to a successful game plan. All coaches and players being on the same page will minimize mistakes. Coaches often discuss the big picture with players, like winning a conference championship or a national championship, but the focus on the little things can create the biggest momentum shift during a game situation. Here is an example of the Ducks on offense. You can see the widest Oregon State players on the field along with the rest of their defense. This is a view that players and coaches are studying. Each player typically looks at how his defender is playing against him (based on the formation and the play called) and what the assignment for that position will be. Let’s look at a different wide-angle shot. This view on the right is a great one for the coaches to develop a greater understanding of player tendencies. In this case the Ducks are in a spread set and you can set the back judge official standing on the Oregon O, in the far left of the picture. Countless hours of studying this defensive formation helps the overall preparation for staff and players. The end zone angle is another method to break down film for players and coaches. 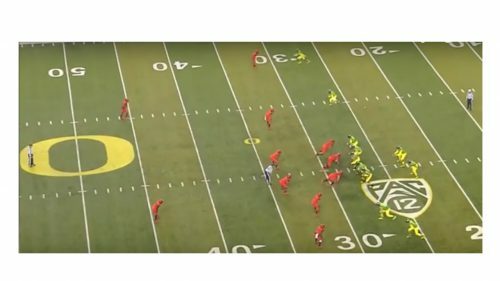 You can see from tackle to tackle from what many coaches call the “The box.” The transparent box from the picture is typically what offensive line coach Mario Cristobal will spend a great deal of his time, studying opponent tendencies, with the Ducks offensive linemen. This also can benefit for running back and the quarterback as there is always a concern for pass protection. The End zone angle can allow coaches to assess pass protection, blocking schemes and rate player quality. Look at the picture to the left for the ultimate viewing experience for the Oregon Ducks football players. The theater enables the Ducks to break down film together, as well as view the weekly scouting report created by the coaches. The scouting report involves essential opponent information such as: the opposing team’s best players, specific offensive and defensive tendencies, overall personnel, important match-ups, potential trick plays and many other components. 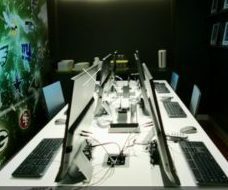 The image to the right shows the room where individual position coaches discuss strategy and give specific directions for the players. This is is great way for players in a smaller setting to focus on their job. While planning practices during the pre-season and regular season, coaches will also break down practice film. As one of my former college football coaches used to say, perfect practice makes perfect performance. As a second-generation coach, I can remember being a manager on my brother’s high school football team. Growing up in Eastern Kentucky, high school football was king and on Friday night the town of Paintsville would shut down to watch the Tigers defend their territory. However, there was much more that went into the game than X’s and O’s. As a young manager, I learned that on Mondays–the great coach Walter Brugh would put up the projector screen and begin to study film with the football players and coaches using a eight-millimeter reel video. We have come a long way since then, transitioning to VHS tapes, to DVD’s and now with video being entirely digital. Film study is the most underrated component of football preparation and one that Coach Taggart and his staff will spend extensive time on to create an exciting 2017 season for the fans. Keep the hours spent in mind when walking into Autzen, as you will see them pay off in touchdowns!